The first is an item I have wanted for a long, long time. I finally found one at a decent price in pretty fair condition. This candlestick phone came with both the original cords and was patented by Kellogg S&S Co. Chicago, from 1901 - 1908. This sucker is heavy -- and I LOVE it! The next group of goodies includes a silver flower vase with removable frog from England. I also got a Victorian magnifying glass with carved wooden handle. I love the silver decoration on it; I can't decide if it's a bat or just a design... the seller thought it was a butterfly. I also bought a few vintage postcards so I can scan them for some upcoming artwork. 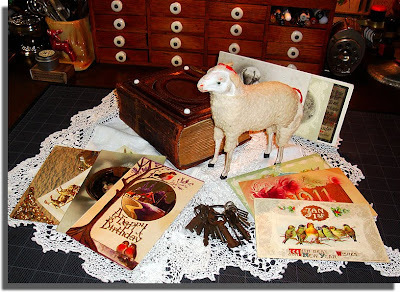 Today I purchased this group of antiques; the sheep was a great cheap find; it is so cute, made of wood and fiber with red ribbons on it's head and tail! A ring of vintage small keys were just what I wanted, and ten more postcards from over a century ago were a steal at a dollar apiece.. especially the ones with the metal embellishments. 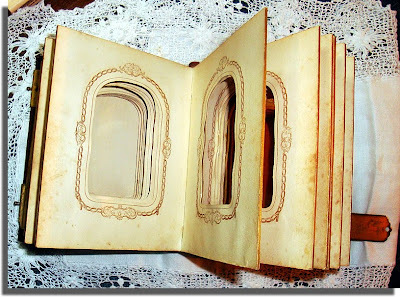 Here are the inside pages; small photos would have slid into each page from the bottom. I am hoping to either collect old photos or perhaps I'll make really small pieces of artwork to add to each page... I haven't decided yet! 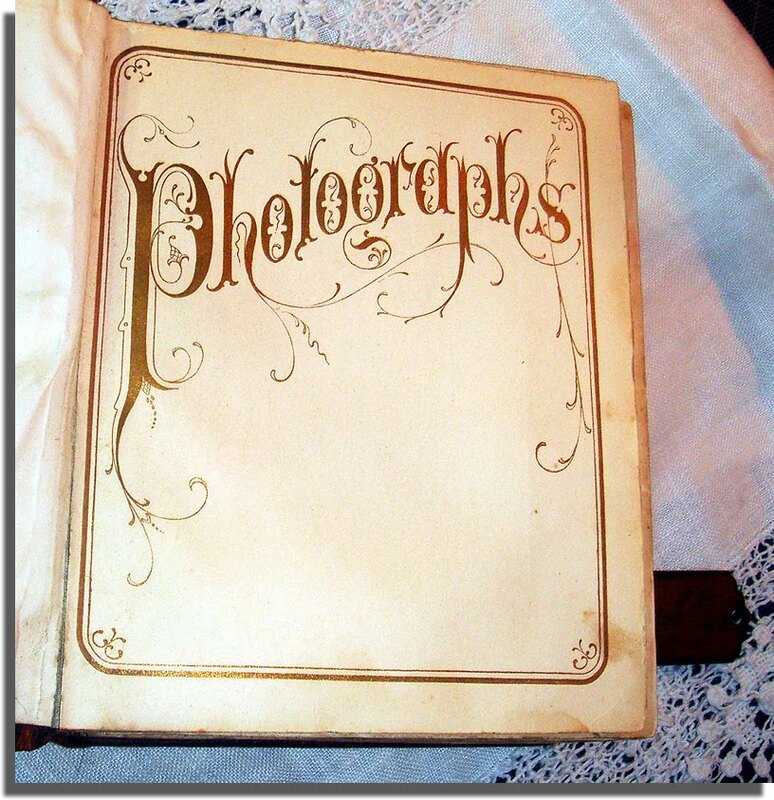 In the meantime, this is a really nice gilt-edged book that looks great on display. 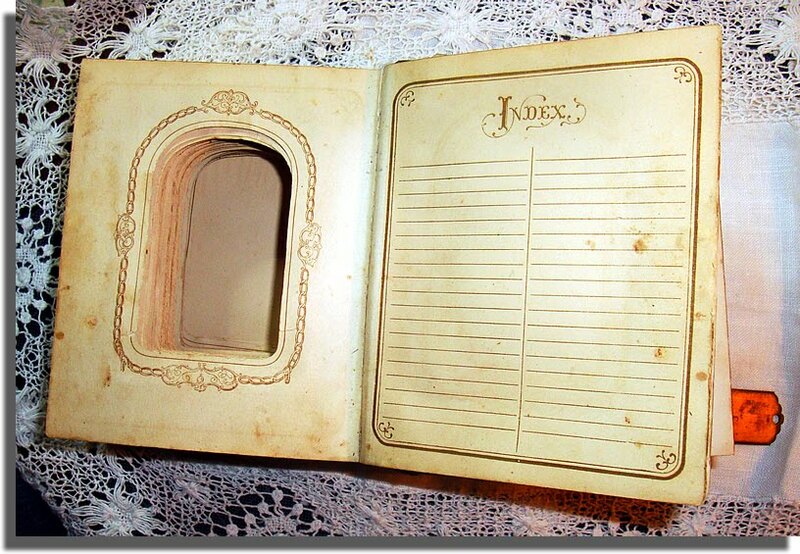 Here is the last, or Index page. 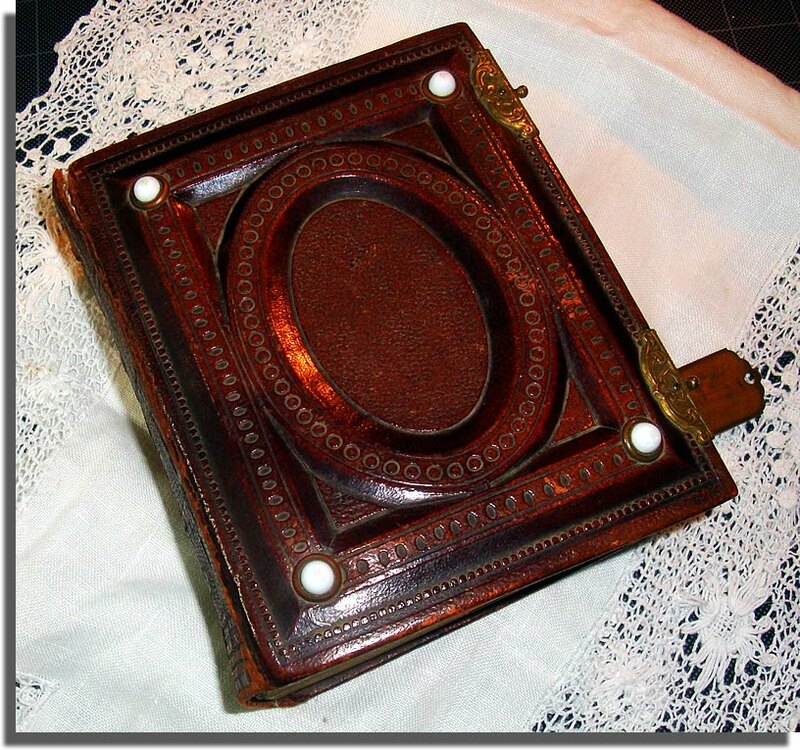 I LOVE finding old items to add to my Victorian Studio; I never know just what I'll discover when on the hunt! This is Tawnee, a Ragdoll -- our youngest feline; a true "Diva" if there ever was one. When she graces me with her presence, it's usually by tucking herself in beside me in my favorite chair. And heaven forbid if I should stop patting her while she's there; if I try, she vocalizes her displeasure immediately. 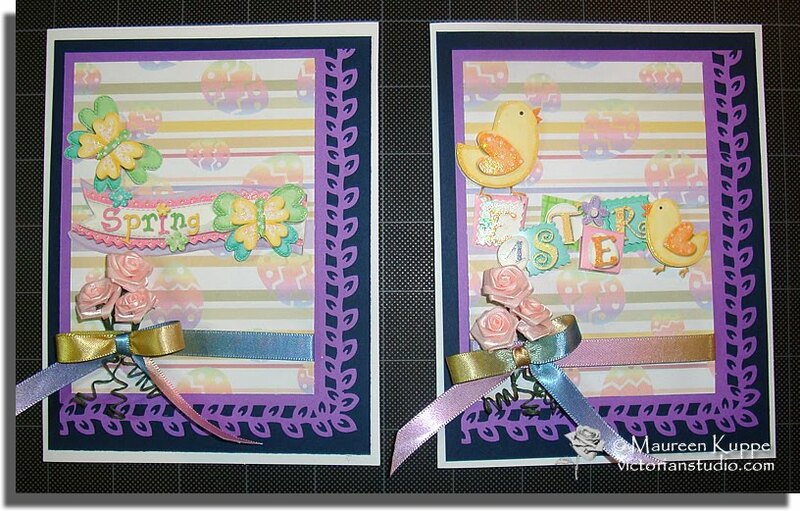 These cards started out with a printed image layered with a sentiment I found online. 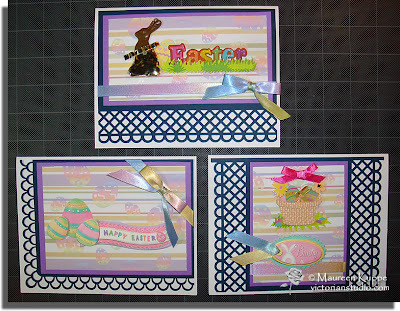 I used Tim Holtz Distress Inks to colour each in. Copics were used to colour the crowns and her blue eyes. I added Glossy Accents on her eyes as well. 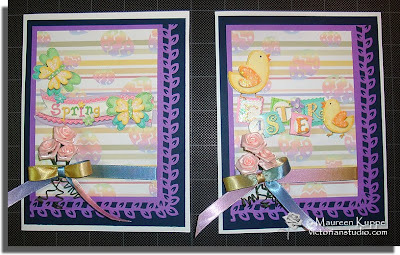 A final touch of Star Dust Stickles was added to the border of each card. The first thing I wanted to try was his dye ink "watercolour" effect using his Distress inks. So I created this ATC with two of his stamps (the bird and saying). The birdcage is from another set (can't remember which one!). I made two of these, again one to trade. I just LOVE the way the ink creates such interesting designs. 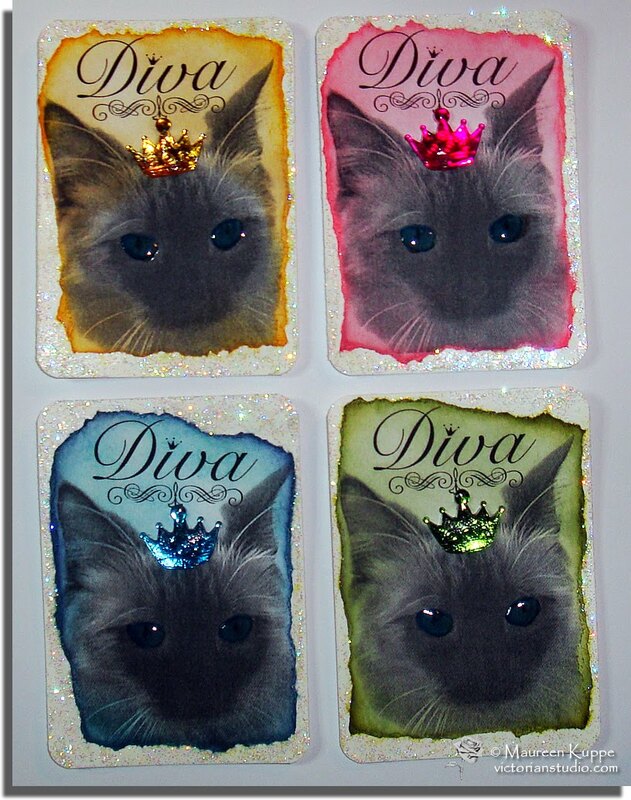 I played around with the idea of using wire underneath a foil layer, so I made three one-of-a-kind ATCs (I'm keeping these ;) - no doubles this time since I was really just playing around). I just bent some craft wire into interesting shapes, laid it on the ATC, brushed on some watered-down glue and laid crumpled foil over top. I then used my finger and a pencil eraser to emboss the foil, careful not to tear it. I coloured them with Tim's alcohol inks and added a few of his charms (the heart, bird and star) too. They had the charms on for a ridiculously low price at Michael's, so I bought all four sets that were hanging there! I attached them with either ribbons or by using his Glossy Accents glue... I tell you, that stuff works great and fast! I am so glad I saw him use it on one of his teaching videos. It even attached that butterfly charm that I bent so the wings would stick up on either side; I simply glued the body part to the ATC. Worked "like a charm"! Ha!!! 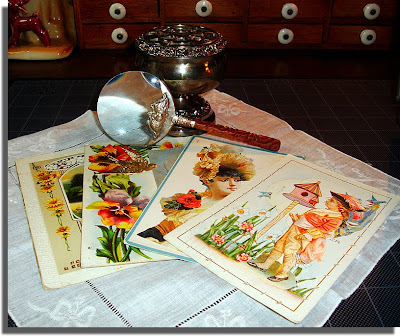 While learning all I could about Artist Trading Cards online, I came across the "Fun With ATCs" blog that features different challenges each week. 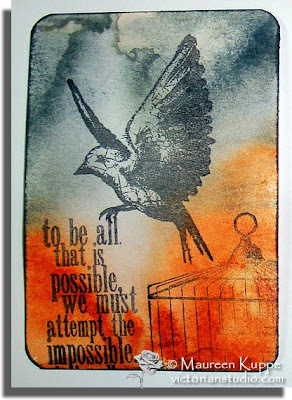 Anyone can participate, and they have some great design team members who create awesome ATC samples to inspire. Even though it is in German (I think! ), they also post in English. I knew just the material to begin with. While at a thrift store a few weeks back, I picked up a bag of craft supplies that had some lovely lace in it. To my surprise, it also had hundreds of sheets of round metallic papers in both gold and silver used to wrap bridal cake for wedding favors! So I tore a gold sheet into two rectangular shapes and mounted these on black cardstock, edged with gold ink. I then pulled some sequin ribbon from my stash and taped it to this before attaching to my ATC card. 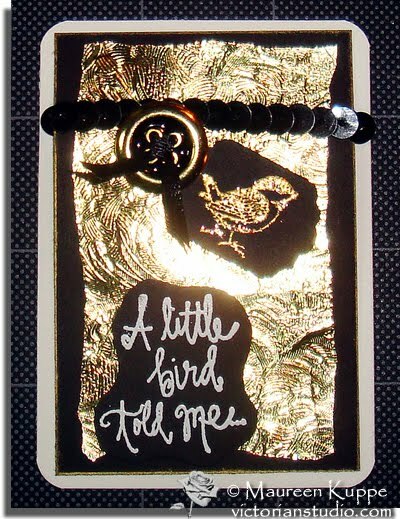 A gold and black button was threaded with black satin ribbon and attached with a tag with a small bird embossed in gold glitter. I used a Spellbinder's die to cut it out. 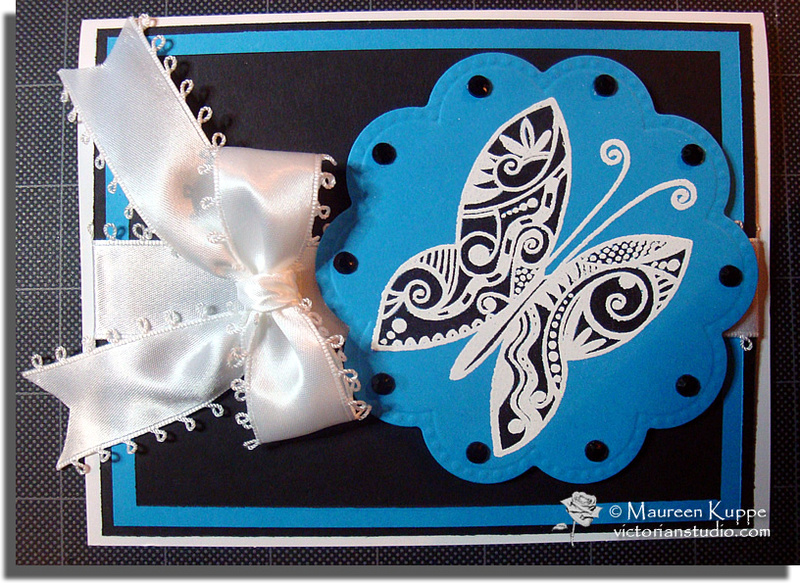 The sentiment is white embossed on black cardstock and cut freehand. As usual, I made two of these at once (I always do this! ); one to keep and one to trade. As usual, I made two of each; one to keep and one to trade. The first features a scan of a Titanic playing card from a set I bought at the Titanic Artifacts Exhibition last year. I ripped and inked a scan of a dictionary page... "Sink". Three brads represent the more than 3 million rivets used to hold the great ship together. The second card is "Tragic"... again, two images scanned from my playing card set, cut out and the newsboy is popped up on foam dimensionals for even more impact. 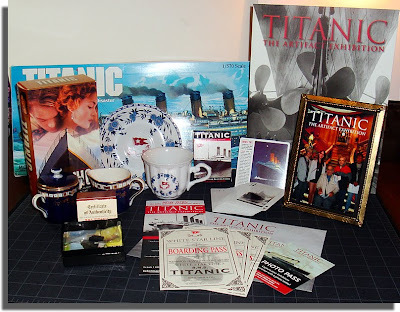 The last card is a compilation of images from my Titanic ephemera, along with a dictionary page on "Titanic". Appropriate. I was going to add more to these, but I think they speak volumes as they are. My second attempt at model building... about five years ago, I won a model of The Jolly Roger (you can read more about that here). 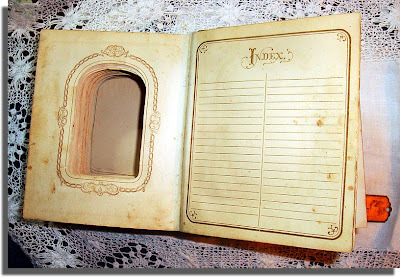 I am sure a lot of men will fondly remember this hobby from their youth, but being a girl, this is something I never tried when I was young. Now I realize that because I love to paint and sculpt, I really wish I had. Hubby did many models... so back in 1987 (two years after Robert Ballard found the wreck), he began a model of the Titanic. 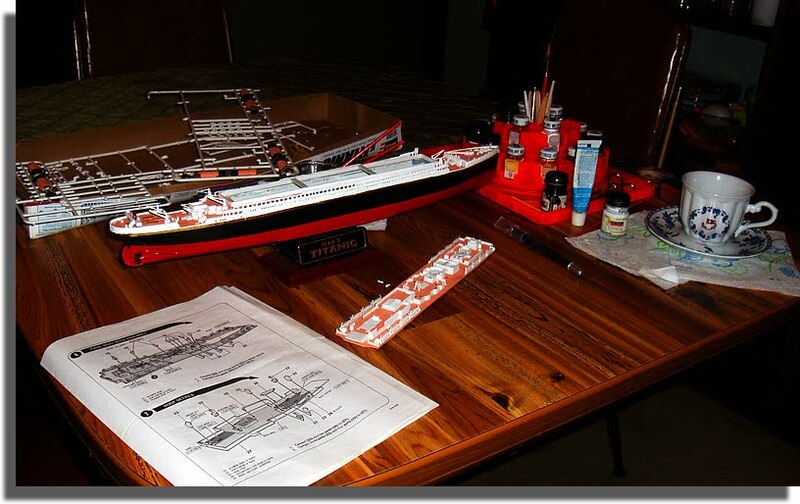 Sadly, he only got as far as painting and gluing the 2 pieces of hull and stand together. I think he got frustrated because he realized he painted it incorrectly... and gave up. I bought him a second new model to start over, but he never even opened it. For 25 years, both boxes collected dust. Until this week, with all the commemorative specials I remembered our own little Titanic, forgotten in the abyss that is his workbench in the basement. I pulled it out and was determined to finally finish it in time for today's 100th anniversary. And I did it! 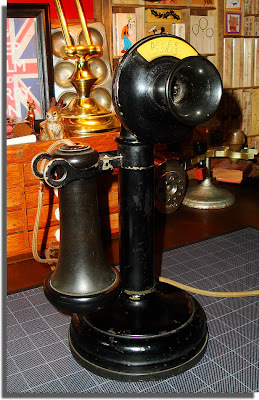 (Did you notice that whilst I worked, I was kept hydrated with beverages from my Second Class White Star Line teacup?) 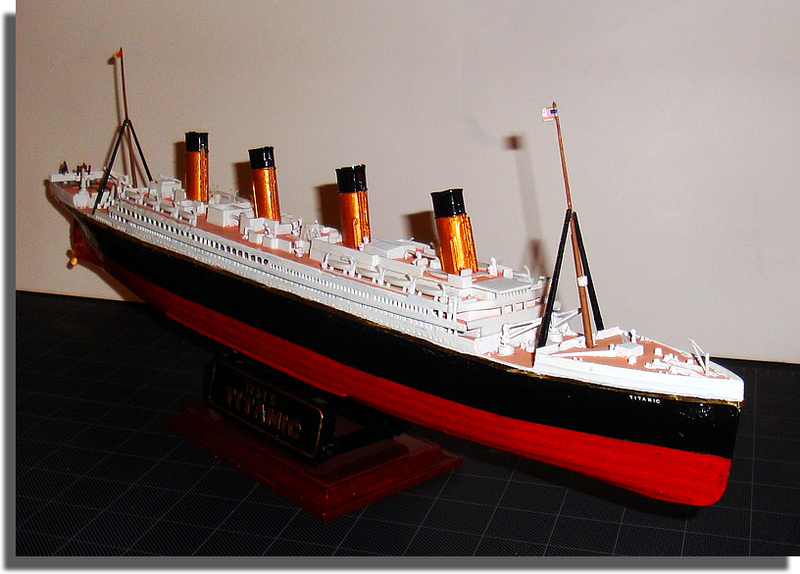 I completed my own piece of Titanic history, which will take a place of honor in my studio. My fascination with Titanic has been lifelong; in 2009 daughter and I attended the Artifact Exhibition in Minneapolis, and in 2011 I took my mother, father, daughter and hubby when it came to Winnipeg. It was an incredibly moving experience; I even have an authentic piece of Titanic coal among my many Titanic "artifacts". Making the model was fun and very educational - I am sure when we watch the movie tonight, I will be especially concentrating on all the details I know so well now. 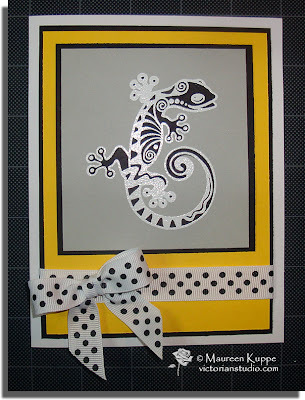 I started by embossing the Michael Strong lizard stamp with Tim Holtz' embossing ink pad and white embossing powder on a grey piece of cardstock. I then heated it up and coloured in the lizard in black ink. What a cool effect this is! I added more cardstock mats and a black and white polka dot ribbon from my stash. 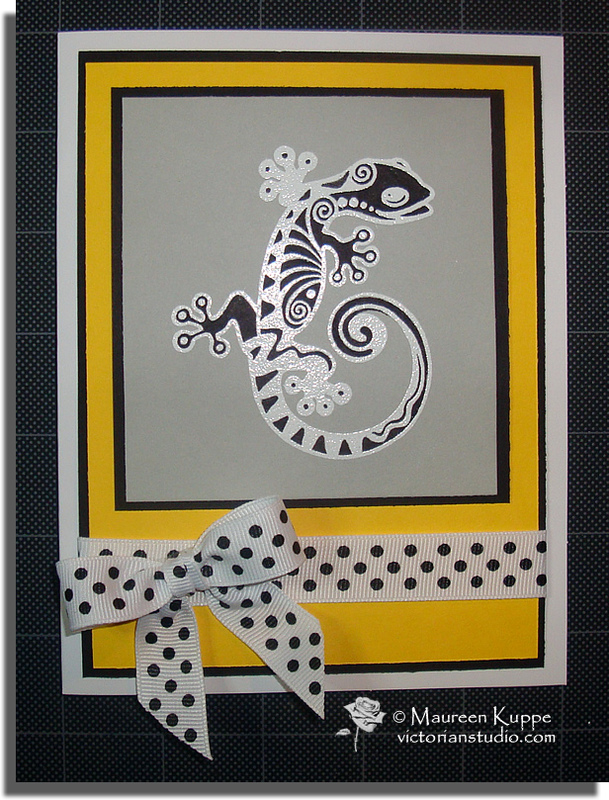 So I made the same style - a different Michael Strong stamp, but the technique is identical to the lizard card. A few black gems decorate the edges of the Spellbinders cut die popped up on foam dimensionals. Underneath runs a wide wide ribbon and bow. I hope the ladies who receive these like them! It is so much fun to make these small pieces, I have already made the three I will trade in May! The black and white one is just a doodle I made. One day I did a whole slew of them; I'll probably trade 1 each per month. 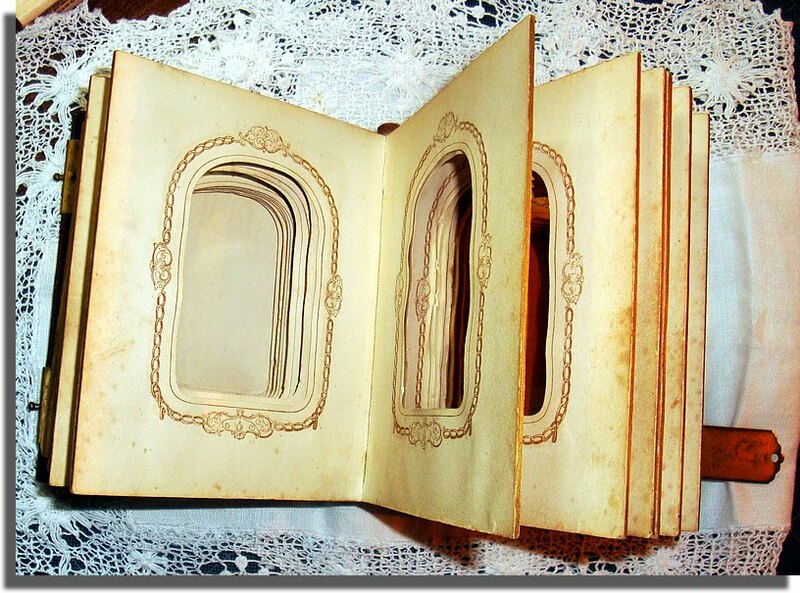 The second is Pinky, torn from a metal Victorian frame I plan to use for another image. But I didn't want to throw her away, so I used her on an ATC along with a sheer ribbon, pink jewel and "Love" sentiment. The last ATC is made from an old Bingo card and matching bingo marker. "Lucky" was stamped and threaded with some blue fiber and an old moth image popped up on foam. At this rate, I am going to have all my cards ready for trading straight through to August in no time at all! What happens when you come down with a bad cold just days before a holiday? A holiday you are hosting a family dinner for, no less? Okay, maybe "cheating" isn't exactly true - but this year instead of hand colouring stamped images, I found some pretty nice Easter stickers at Michael's to decorate my family cards. To be honest, what made me buy them was the chocolate rabbit... it looks so real and yummy! I just know daughter will love it. 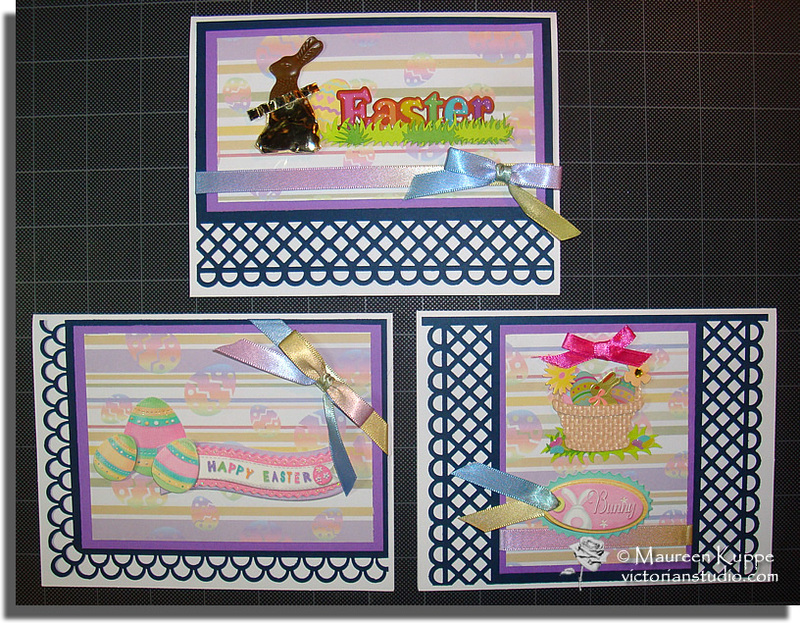 I also saved time and what little energy I had by using the same colour combinations and patterned papers for all five cards. I just mixed up the styles a bit. Well, at least I got them made... now to think about Easter Sunday dinner. I just hope this darn cold goes away by then.